The A47 is closed in two places near Peterborough this afternoon, Sunday, following two serious crashes. The A47 westbound in Cambridgeshire is closed between the A1260 (near Peterborough) and the A1 (near Wansford), while the emergency services deal with a serious collision involving a car and an Argos lorry. The air ambulance has attended the scene and police confirmed at least one person suffered serious injuries. 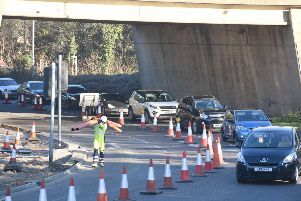 A spokesman for Highways England said the diversion was to: "Exit the A47 westbound approaching Peterborough early, by joining the A1139 southbound. Follow the A1139 towards the A1(M). Join the A1 northbound at junction 17 towards Wansford, to then re-join the A47." The A47 is also closed between Guyhirn and Thorney following a crash earlier today. It is closed both ways from B1167 New Cut to A141 March Road.